I love customizing my tween portraits around the subject being photographed. I want to know their likes and dislikes and current joys. This young lady is very studious and absolutely loves to read, and Mom wanted to incorporate her love of reading into the session, so I suggested that she bring a few favorite books. We also planned out the outfits and colors in advance of the session. Mom and daughter both love the color purple and this t-shirt had a very cool saying represented by a mathematical equation (essentially B greater than average). Mom really wanted her to wear this t-shirt, because she loved the message and the brilliant way it was represented on the t-shirt, so we selected my purple backdrop to pair with it. 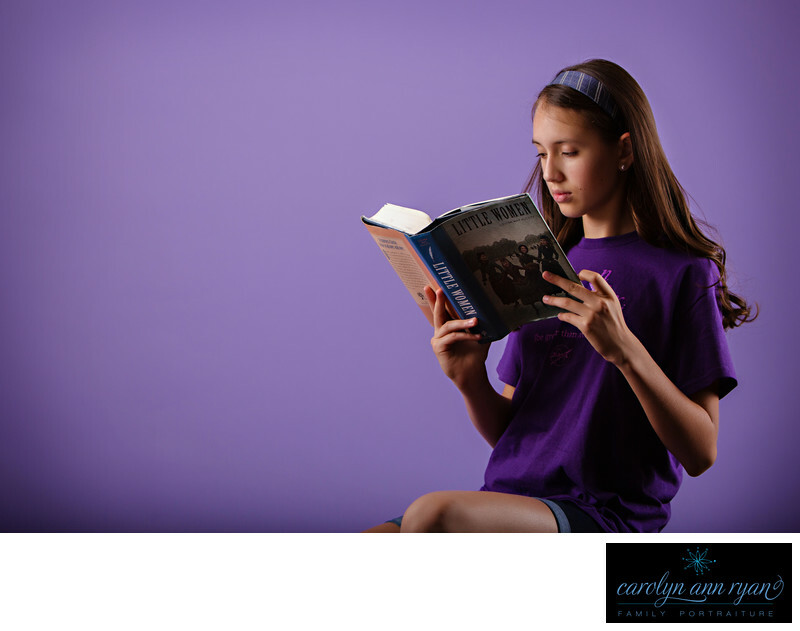 The tween was currently reading Little Women, and I love how the colors in the cover worked well with the purple backdrop, t-shirt and blue jeans. It just blended so nicely, and I love the beautiful rim light captured on the book from my hair light near the subject's back. I'm will be getting my new home studio ready again and looking forward to working with more Tweens to not only capture their amazing personalities, but give them the confidence in themselves that they need at this age. Keywords: book smart (6), books (9), Charlotte NC (180), Charlotte tween photography (12), Charlotte tween portraits (12), charlotte tweens (3), Fashionable (27), intelligence (15), marvin NC (72), north carolina (78), portraits (78), purple (24), studio (48), Studio Portraits (33), tween (81), Tweens (60).